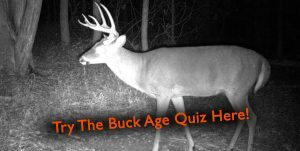 While it isn’t nearly as much fun as planting food plots or applying prescribed fire, one of the most important things that habitat managers can do is control invasive plant species. Woody invasives will never just go away, and it is better to control them sooner rather than later. In this article, I will cover two methods for controlling woody invasives. 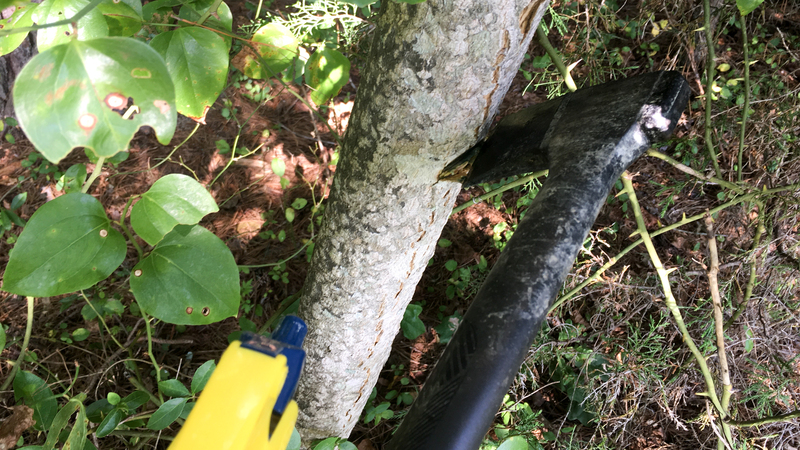 For invasive tree species, hack-and-squirt is often the best technique. It only requires a hatchet and small bottle of herbicide, and it doesn’t take much time to knock out a patch of invasive trees. With hack-and-squirt, you simply mix up a bottle of chemical and squirt this mixture into a hack on the stem. The herbicide of choice depends largely on the species being controlled, but both Garlon-3A (triclopyr) and Arsenal (imazapyr) are options that will kill most species of interest. Depending on the size of the stem being treated, multiple hacks may be necessary. All of the information on herbicide mixing and number of cuts needed for each stem can be found on the herbicide label. (Above) Treating this tree-of-heaven with hack-and-squirt only took a few seconds, and required no expensive tools. There is another benefit of using hack-and-squirt for woody invasives instead of felling the entire tree. For some species, such as tree-of-heaven, cutting the entire tree down triggers root sprouting. This is true even when the stump is treated, and the only way to avoid this root sprouting is to allow the roots to remain connected to the top of the tree. I learned this the hard way, as I made a patch of tree-of-heaven much worse several years ago by cutting it down and treating the stumps. Hack-and-squirt can be used successfully on these trees, as the stem is not disconnected from the root system and so doesn’t trigger root sprouting. While not every tree species does this, the root sprouting abilities of tree-of-heaven highlight another benefit to using hack-and-squirt under certain circumstances. When working with a multi-stemmed shrub like privet or autumn olive, hack-and-squirt is not nearly as efficient of a technique as cutting the plant off at the stump. Usually, these shrubs are thick enough that swinging a hatchet is difficult. Plus, one would have to hack every single stem to be effective. In these conditions, I choose to use a cut stump treatment to control invasives. With cut stump treatments, you simply take a chainsaw and cut the entire shrub down, then spray herbicide around the edge of the stump. Both Garlon-3A and Arsenal work for this treatment, as does a high rate of glyphosate for some species. As long as the species does not root sprout before the herbicide can take effect (and neither privet nor autumn olive do), this technique works extremely well. One of the side benefits to cut stump treatments of shrubs is the instant cover it creates on the ground that is used by small mammals and birds. While this benefit is ephemeral, it is nice to create cover while also killing woody invasives. On our farm, one of the best rabbit hunts I have been on took place in a patch of privet that I had killed two years prior. Brambles had begun growing amongst the dead tops, and deer sign was everywhere. With one dog we ended up killing 6 rabbits in a 5 acre patch, and also had 4 or 5 that got away. While I was managing this area to improve it for deer, spots with that many rabbits are sure to have high-quality cover for whitetails as well! Woody invasives will never just go away, and as the saying goes, the best way to eat an elephant is one bite at a time. The great thing about controlling woody invasives is that they can be treated any other time of year than spring. Despite the heat, now is the perfect time to get out and kill some woody invasives before they set seed this fall!